Or do they just want spoon-feeding? Do they not grade on a curve in Sheffield? Unless I'm completely missing something, the answer to 1 could be that it's roads, communication networks, and anything else where adding a single node to the network requires construction of more than 1 link, with more links needed as number of prior nodes increases, hence the exponential (possibly also including management/administrative costs and the difficulty of coordinating large numbers of people). 2 makes me think they just want the intersection between either these two curves, or the intersection of an additional "consumption per capita" (my guess would be that it's proportion to N, then add in coordination cost). 3 sounds like they just want something about improved worker productivity and technological reductions in coordination cost. Note: I've literally never taken an economics course in my life. We can't possibly assess how well an exam question fits a course with absolutely no knowledge of the assignments, lectures, etc. of that course. 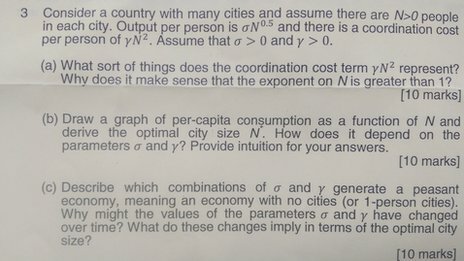 That said, the question shown is a conceptual question, not a math problem. I can well imagine why undergraduate students would object to challenging conceptual questions, given the undergraduates I've known. In any case, sometimes exams are difficult. My engineering hydraulics final literally made me cry. Why is this a news story? The article seems to be saying that this question contains topics that the students were not told to study. For example, the students were told, "You'll have an exam on chapters 1 through 5." And then the exam contained a question from chapter 8. Something like that.